"Normally, pancreatic enzymes are produced in an inactive state..."
"...although it may be triggered in some cases by a fatty meal or corticosteroid administration." The most common clinical signs include nausea, vomiting, fever, lethargy, abdominal pain, diarrhea and decreased appetite. During an attack, dogs may take a "praying position", with their rear end up in the air while their front legs and head are lowered onto the floor. If the attack is severe, acute shock, severe depression, and even death may occur. The successful management of pancreatitis will depend on early diagnosis and prompt medical therapy. With mild, edematous pancreatitis, the treatment is supportive, by "resting" the pancreas and allowing the body to heal itself. 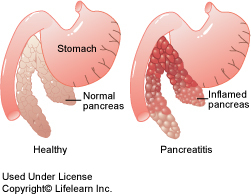 The only way to "turn off" the pancreas is to withhold all oral fluids and food, so that it is not required to secrete any digestive enzymes that may inadvertently injure itself or surrounding organs further. 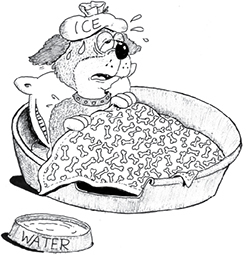 "Analgesics...and intravenous fluids will be given..."
"Most dogs recover without any long-term."